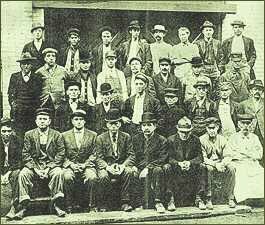 Photo of Pullman workers courtesy of Historic Pullman Foundation. This collection contains information from the Pullman Car Works located at 111th Street and Cottage Grove Avenue in Pullman (Chicago), Illinois, one of the largest employers in the area. There are approximately 200,000 individuals represented in this collection. The collection does not include the records for all Pullman employees at all locations, and does not include records of Pullman porters. Information varies for each individual’s packet. It may contain only a name or an entire employee file, including birth certificate, military records, pictures, family relationships, work history, education and cause of death. The Pullman collection is not open to the public. Research is done only by authorized Pullman Committee members. The Pullman Committee reserves the right of omission. Some information may not be released due to the Privacy Act. For FREE, the SSGHS volunteer staff will search the employee records of the Pullman Car Works (circa 1900-1949). We will look up the name(s) you request and also include other individuals with that surname.